Somyot Prueksakasemsuk is to appear in court again on 19 Sept to hear from the Criminal Court to announce the date of the issuance of the verdict of Somyot’s criminal trial. In the same time, it will await the decision of the Constitutional Court on the request forwarded by the Criminal Court.Constitutional Court?s verdict as to whether or not the l?se majest? law is unconstitutional in response to a petition by him and his lawyers. He, however, speculates that the decision of the Constitution Court will not be delivered on that day and the verdict in on his specific case will be further postponed until the constitutional verdict is reached. This means that Somyot faces a further and potentially long period in prison. Hence, we are again calling for your international solidity to continue sending the letter to Thai authorities in order Somyot can be released soon. We need to ensure the least that Somyot should be released on bail while he s waiting for the verdict. If he is not being released un conditionally. This letter will be submit by TLC and other organizations in Thailand to Thai Authoritoes before the 19 Sept 2012. Open letter : Call for the release of Somyot Prueksakasemsuk ! We are writing to you in connection with the continued detention of Somyot Prueksakasemsuk whose case will be heard again on the 19 September 2012 and who can face the maximum penalty of 30 years? imprisonment. He has been in pre-trial detention for more than a year since the arrest by officials from the Department of Special Investigation in April 2011. We believe the denial of bail is part of an ongoing pattern of harassment and intimidation of human rights defenders in Thailand. We ask the Thai judicial authorities to ensure that the rights of Somyot Prueksakasemsuk are upheld during his detention and that he is accorded his right to a fair trial, including the right to bail. Human rights defenders in Thailand, especially those working on freedom of expression, are able to carry out their legitimate human rights activities without fear of reprisals and free of all restrictions, including judicial harassment. Somyot Pruksakasemsuk, 50, is an editor of Voice of Taksin (translated as ?Voice of the Southerners/ Voice of the Oppressed?) magazine and a prominent Thai labour rights activist. He is known for his tireless efforts in supporting the empowerment of the workers movement and the establishment of democratic trade unionism in Thailand. In 2007, he began to edit the Voice of Taksin magazine, a publication that covers political issues and analysis. Somyot is also the chair of the Union of Democratic Labour Alliance and the leader of the 24th June democracy group. Prior to his arrest, he played an active role in the campaign to repeal the l?se majest? law (Article 112 of the Criminal Code). Somyot was detained for 21 days in May ? June 2010 under the Emergency Decree on Public Administration in Emergency Situations. Somyot was arrested on 30 April 2011 in Aranyaprathet district, Sa Kaeo Province, and later charged with violating Article 112 of the Thai Criminal Code which states that ?whoever defames, insults or threatens the King, the Queen, the Heir-apparent or the Regent, shall be punished with imprisonment of three to fifteen years?. According to the Public Prosecutor, Somyot is alleged to have allowed the publication of two articles in the Voice of Taksin that make negative references to the monarchy. The articles were written by Jit Pollachan, a pseudonym made up of the names of two Thai left-wing thinkers ? Jit Pumisak and Asanee Pollachan. If found guilty, he could face a maximum of 30 years imprisonment. His arrest came only five days after The Democracy Network, in which Somyot is involved, launched a campaign to collect 10,000 signatures to petition for a parliamentary review of Section 112 of the Criminal Code.Previously, his name was included in a chart published by Colonel Sansern Kaewkamnerd, the Center for the Resolution of Emergency Situations (CRES) spokesperson, on 26 April 2010. The chart contained numerous names of individuals whom the CRES accused of being ?anti-monarchy.? However, no credible evidence has been presented to substantiate this vague allegation. 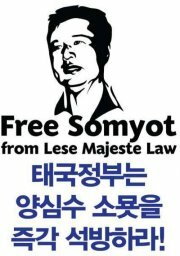 Somyot has been arbitrarily detained since 30 April 2011, for a period of 15 uninterrupted months. Requests for his release on bail have been repeatedly rejected by the court, as is the usual practice with l?se majest? suspects. The last request was denied on 18 May 2012, the tenth refusal. This is in violation of the constitutional guarantee of the right to bail under Section 40 (7) of the 2007 Thai Constitution, the right to a fair trial under the International Covenant on Civil and Political Rights (ICCPR) which Thailand ratified in 1996, and Principles 36-39 of the Body of Principles for the Protection of All Persons under Any Form of Detention or Imprisonment (1988). Prolonged pre-trial detention undermines the right to be presumed innocent until proven guilty, auniversal right protected under the Thai Constitution and the ICCPR; it also affects Somyot?s and his lawyer?sability to adequately prepare his defense. Somyot?s trial started on 21 November and took place in several different provinces of Thailand. For the hearings involving the witnesses for the prosecution, Somyot was transferred to the provinces of Sa Kaeo (21 November 2011), Petchabun (19 December 2011), Nakorn Sawan (16 January 2011) and Songkla (13 February 2012). The last hearing was postponed at the last minute although Somyot had already travelled there and rescheduled to take place in Bangkok due to the absence of witnesses. Despite the fact that all prosecution witnesses work and live in Bangkok, the court ordered the hearings to take place in the provinces based on the witnesses? house registration. Such practice has been criticised for hindering the full presence and participation of trial observers, diplomatic corps as well as journalists and undermined his right to a fair trial. Somyot suffers from hypertension and gout. 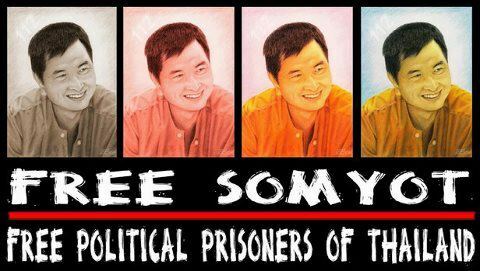 Due to the scheduling of hearings in provincial courts between November 2011 and February 2012, Somyot was transferred from prison to prison and had to stand up in a crowded truck. His ankles were shackled with a chain weighing 10 kilograms and he was denied access to rest room facilities during the journey. The total distance travelled under such conditions was 4,000 kilometres across the country. He is currently detained in the Bangkok Remand Centre, which is also notorious for its overpopulation and inadequate healthcare. Long-distance transfer and prolonged pre-trial detention aggravate Somyot?s health conditions, which could worsen if the taking off medicine for hypertension and gout is interrupted. lawyer submitted the request directly to the Constitutional Court, which decided on 18 May to reject this request on the ground that Somyot had not exhausted other means to exercise his rights, as required by Section 212 of the Constitution and the Court?s rules. However, on 7 June, the Criminal Court decided to forward his lawyer’s initial request to the Constitutional Court. On 26 June, the Constitutional Court informed his lawyer that it had received both requests and also attached its 18 May decision in full. The Criminal Court will not announce the date of the issuance of the verdict of Somyot’s criminal trial until 19 September 2012, as it will await the decision of the Constitutional Court on the request forwarded by the Criminal Court. The UN has raised serious concerns regarding the pre-trial detention of those accused of lese majeste and more specificlaly regarding Somyot’s case. On 9 December 2011, Ravina Shamdasani, Spokesperson for the UN High Commissioner for Human Rights stated that the office is ?concerned about the extended periods that accused persons [under lese majeste law] are being held in pre-trial detention?. On 20 December 2011, El Hadji Malick Sow, Chair-Rapporteur of the UN Working Group on Arbitrary Detention;Gabriela Knaul, UN Special Rapporteur on the independence of judges and lawyers; Frank La Rue, UN Special Rapportuer on the promotion and protection of the rights of freedom of opinion and expression; and Margaret Sekkagya, UN Special Rapporteur on the situation of human rights defenders wrote a joint letter of allegation to the Thai government raising concerns about the physical and psychological integrity of Somyot and that his detention may be related to his human rights work and his legitimate exercise of his right to freedom of opinion and expression. Somyot was one of the five human rights defenders shortlisted for the Somchai Neelaphaijit Award for outstanding human rights work in July 2012. The award, which was given out by the Somchai Neelaphaijit Memorial Fund, aims to honour human rights defenders who have fought to protect human rights bravely and vigorously, and who have at times put themselves in danger to defend human rights like the disappeared human rights lawyer Somchai Neelaphaijit.